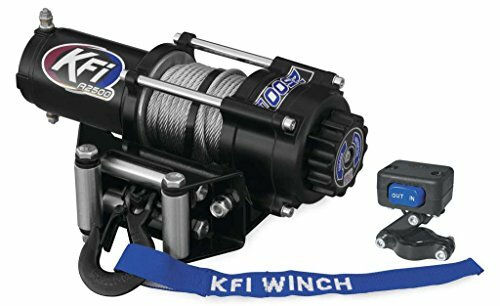 This listing is for a brand new KFI 2500 lb Winch and model specific winch mounting kit for the ATV model(s) listed above. This 2,500 lb ATV Series winch features water-resistant seals to keep the elements out, a standard 4-hole mounting design and a heavy-duty all metal turn clutch. • Rated line pull: 2,500 lbs. • Motor: 12-Volt DC, 1.2hp permanent magnet • Gear ratio: 171:1 • Cable: 3/16" D x 45.9' L • Winch dimensions: 12.67" L x 4.06" D x 4.2" H • Mounting bolt pattern: 3" x 4.875" 4-hole • Winch weight: 24.8 lbs.